While there are almost infinite varieties of mounts, they all fit into four main categories: flat, tilting, articulating and ceiling mount. 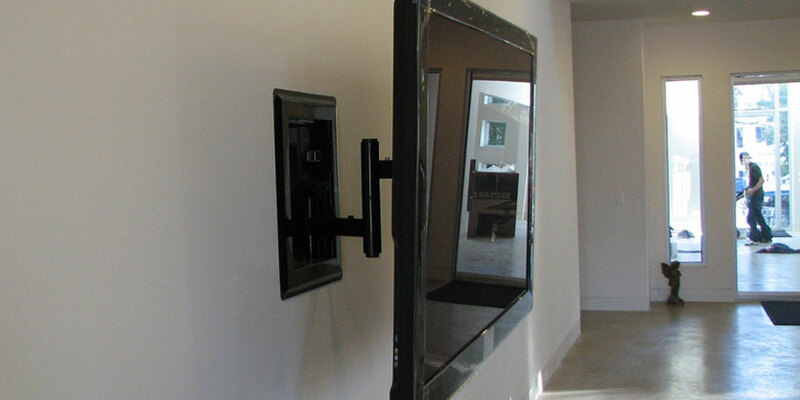 Also called “low profile” or “fixed,” this type of mount allows the TV to fit as close as possible to the wall. It’s ideal for a sleek profile. Although most flat mounts don’t allow for movement, certain brands have options that slide left-to-right. Flat mounts work well in spaces where your seating is directly in front of the TV and where you can control the lighting. 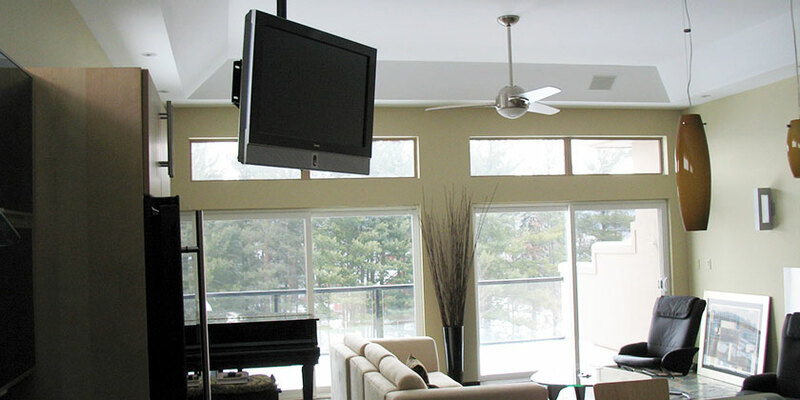 If your location is near a window without blinds or if it’s outdoors, you may encounter a glare that a tilting or articulating mount would be able to address. 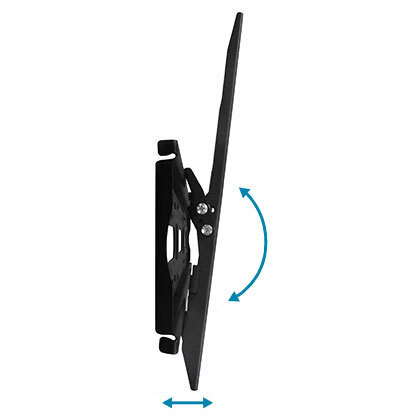 A tilting mount looks similar to a flat wall mount, but with this type of mount the TV can be tilted up or down. 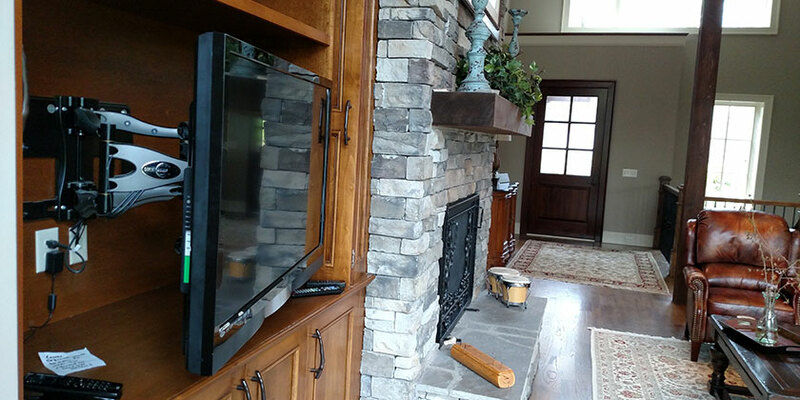 Tilting mounts are ideal if you need to mount your TV above a fireplace or other object at eye-level when seated. Tilting mounts also allow you some control over glare, but depending on your lighting situation you may need more flexibility to fully address glare issues. This type of mount is also called a “tilt and swivel” mount. It functions as the name implies, allowing you to tilt up and down as well as left to right. A swing arm pulls the TV away from the wall so you can position it where you need it. Articulating mounts are perfect when you want to install a TV in a corner of a room or anywhere you need to view the TV from an odd angle. They also work well for open floor plans with multiple seating areas, so you can view the TV from different areas. Because the arm allows you to pull the TV out, this type of mount is also ideal when you want to tuck away the TV when you’re not using it, such as into an armoire. This type of mount is often used in commercial setting such as restaurants and bars, although they are sometimes featured in homes as well. They’re perfect for high ceilings or rooms with all-brick walls to maintain the look of the brick. To decide which of these mount types is right for you, think first about where and how you’d like to use your TV. In the center of an entertainment room? In the corner of a living room? On a covered deck? Will your seating all be in one location or spread out around the room? Do you want your TV to tuck away when not in use? Second, consider your lighting. Can you control the lighting, or will you need to adjust the position of your TV to mitigate glare? Choosing the right mount will give you the ability to enjoy your TV the way you want to, with whatever look and in whatever position. Need help choosing your TV mount? 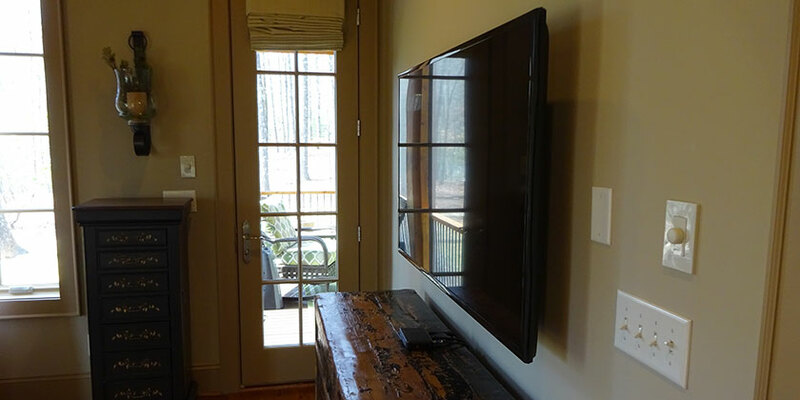 Check out our professional TV mounting services and feel free to give us a call at (864) 881-1675 with any questions.